Although I consider Margaret Atwood one of my favourite authors, I had only previously read three of her 20 novels (which are but half of a body of work which includes, children's books, several volumes of poetry and a number of non-fiction works). The Edible Woman was her first novel, published in 1969. It's main protagonist is Marian, a single woman in a changing, but male dominated, world. Unlike her single colleagues (the office virgins) or the older spinsters amongst whom she works, Marian is taken, and on the road to being engaged and married. This apparently conservative approach to life is contrasted by her flatmate, Ainsley (who wants a child but without the ties) whilst her future is envisaged in the form of another friend, Clara, who is married and pregnant with her third child. All is not as it seems in her ideal world. As the novel progresses, Marian finds herself being torn between her future with Peter and a complicated relationship with Duncan, a student who remains un-named through much of the book. Her life changes out of it's routine and staid pattern becoming increasingly erratic as she is forced to confront what she really wants out of life. This is a book of three parts - the first and third are written in the first person whilst the second is in the third person as Marian becomes somewhat detached from herself. I found I raced through the first part but that the book became less engaging in the second and as the novel went on - indeed, as Marian became more detached from her ideal life, I found myself becoming detached from engaging with the book. It's a novel about identity and society, about love and expectation. About how our circumstances shape what society expects of us and how we, in turn, then choose to act. About how our expectations of life shape our behaviour and how our behaviour changes our expectations. Specifically, though (and in common with much of Atwood's work), it is a book about female identity; in particular, it is about individual feminine identity in a masculine world and the costs of asserting this against the grain of with societal norms. In many ways it was a typical first novel - a good idea, and interesting structure, some grand themes and a great deal of promise but slightly disappointing execution. Whilst I would say I liked it, it's not on my list of books I love. I do anticipate I will re-read this at some point in the future - but only on account of it being an Atwood and not for its own sake. This is the second time in a couple of days that you've made awakened me to literary works I've missed out on. 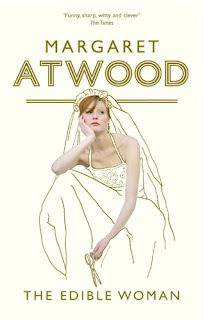 Shamefully, not yet read a single one of Attwood's novels, which is something crying out for remedy (before it's too late for me!). I recently read The Edible Woman and I agree with a lot of what you said. While I’m a huge fan of Margret Atwood this book was pretty hard to engage with. However, in a way I think that’s the beauty of The Edible Woman. In my own review I talked a lot about how I found my own emotions mirroring the main character’s. I was listless, foggy, everything that Marian was for a lot of it. It’s just a thought of course. I could be reading into it too much, but I would like to believe a lot of the difficulty that this book posed was done on purpose.